In the late 80's there were over 46,000 different types of plastics with that number growing everyday as researchers discovered new ways to make plastics or additives to give them new properties. For that reason alone the plastic industry developed a coding system that identifies whichtype of plastic a container may be made of. The system uses the numbers 1 through 7 inside of a mobius loop to identify the six main types of plastic with number 7 being all others. The coding system is very useful in identifying the type of plastic a container is made of but it is often confused by consumers as meaning that a container is recyclable. The Association only accepts plastic bottles and containers that have established long term markets. 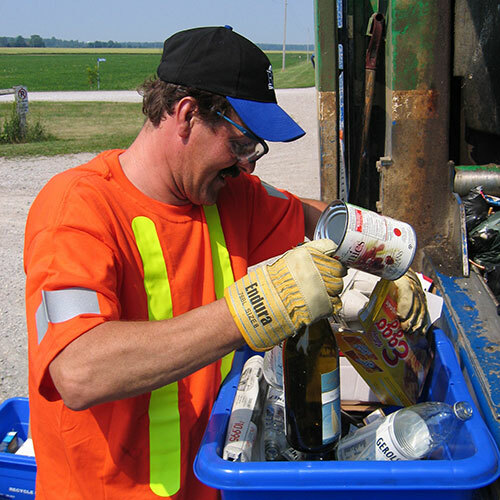 In 1995, the Bluewater Recycling Association developed a new vehicle which allows for the collection of waste and recyclables at the same time. The vehicle designed by the Association lowered costs, produced less pollution and less traffic than traditional curbside collection alternatives. The Association developed the new vehicle when a time and motion study revealed that up to 85% of collection time was in fact spent driving the vehicle rather than loading it. Therefore, it became evident that if one truck could pickup both waste and recyclables then the increased work load would be minimal. The theory proved to be correct. Today, the Association services most municipalities using this system. When One is better than Two. The co-collection truck is carefully divided into three separate compartments to ensure that the materials sorted by you the householder can be kept that way. This way we guarantee that everything will be recycled. One of the most common misconceptions about the co-collection vehicle is that paper products are thrown in with the waste to be disposed of. This couldn’t be further from the truth. Understandably people associate the mixed container bucket as the recycling bucket and the waste and fibre hopper as the disposal hopper. The reality is that the co-collection vehicle is carefully divided into three separate compartments to ensure that materials sorted by you, the householder, can be kept that way. This way we can guarantee that everything will be recycled. The mixed containers are loaded into the bucket between the cab and the body. In the newer vehicles the bucket has been moved to the side of the truck. When the bucket is full, the driver activates a lever and the bucket full of material is lifted and delivered to the upper compartment. A ram then pushes the mixed containers into the body to be held until ready to unload. 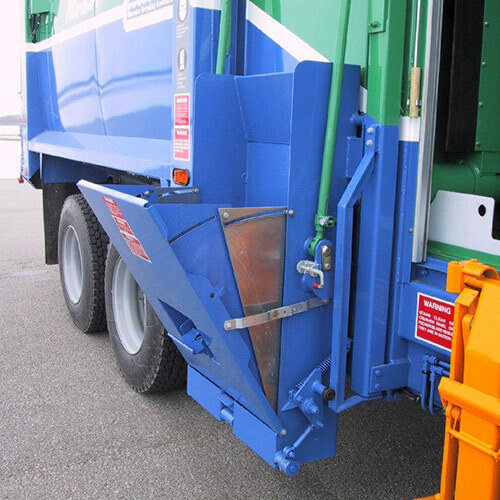 Mixed fibres and waste are loaded through the opening at the front of the body behind the cab before being compacted into the body. The waste itself is loaded into the lower curb side hopper. The paper products are loaded through the same window as the waste, but are placed in the lower roadside compartment. The mixed fibres and waste are pushed through the entire body before reaching their respective bustle gates shown below. This creates a smart and economical way of separation found only on Bluewater Recycling Association trucks. 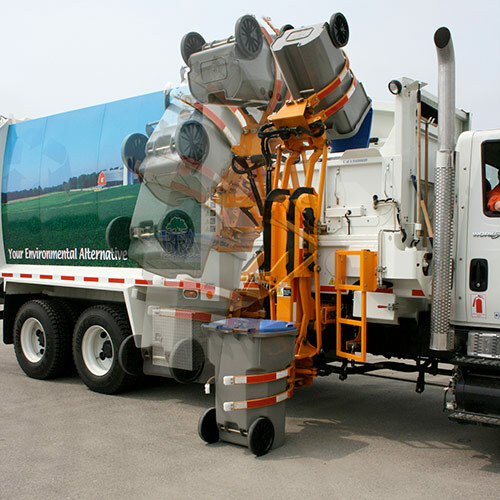 The co-collection truck revolutionized our industry locally in the 1990’s making curbside collection of waste and recyclables affordable for many rural areas for the first time ever. Click here for a video on how the co-collection truck functions. Our newest type of collection vehicle is the automated collection vehicle. 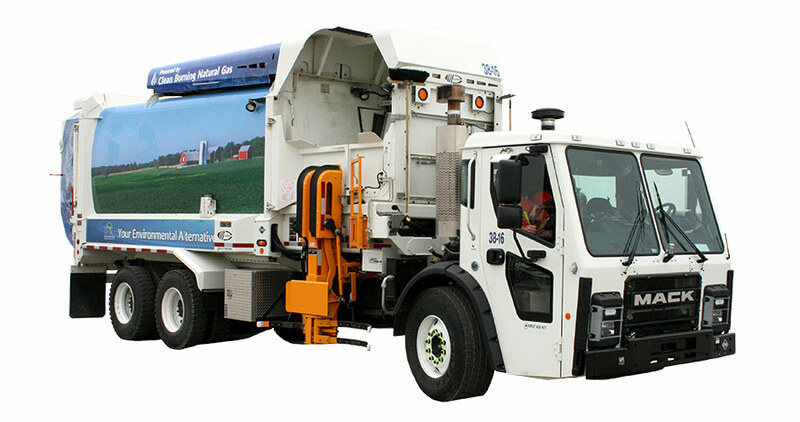 These vehicles are the latest technology available for collecting waste and recyclables. While they are the latest technology, the concept is hardly new. The first vehicle equipped with a mechanical arm to collect standard containers was first used in 1969 by the city of Scottsdale, Arizona. Today’s vehicles are refined with the smoothest most accurate hydraulic controls packed in a joystick like those used by game craving teenagers instead of a multitude of control sticks. Instead of collecting barrels they are used to collect wheelie bins. The new vehicles come in two configurations. One type has two compartments; one for recyclables and one for waste, perfect for co-collection in the rural areas where most of our time is spent driving from stop to stop. 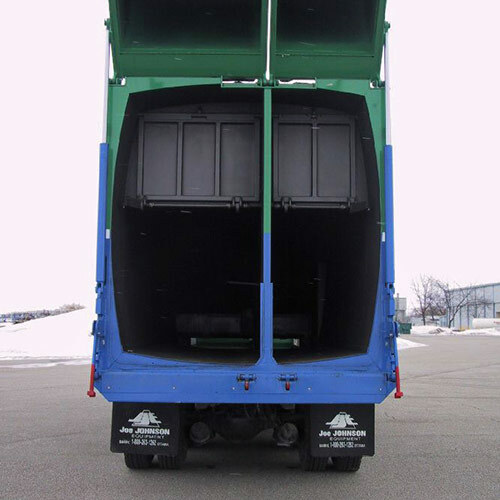 A moveable chute in the hopper diverts the material into the curbside or roadside compartment. The other configuration has one compartment only to collect either recyclables or waste at a time. This configuration is very useful in recycling only communities or in very urban areas with a local landfill. In that latter, waste wheelie bins are collected first and the vehicle is emptied locally before collecting the recyclables and taking them back to our processing facility. The new vehicles will enable us to lower or maintain program costs while providing the residents with more capacity to recycle more. The vehicles virtually eliminate injuries common in our industry. Our plan is to convert up to 80% of our households to this new system. Residents benefit with having bins that are up to six times the capacity of the blue box that facilitates and encourages more recycling. The fixed wheels make hauling them to the curb a lot less work than before. Using bins with lids helps to keep water, ice, and snow from set-outs, which helps to control the water contamination and helps sorting. Discourages scavenging of valuable materials. Using bins can improve neighborhood aesthetics —uniform containers often eliminate unsightly set-outs. Blowing litter can be reduced because containers with lids are more resistant to being tipped over or torn apart by dogs, raccoons, crows, etc. Containers with lids can help control odour and vector concerns associated with keeping recyclables or residential solid waste for longer periods of time. 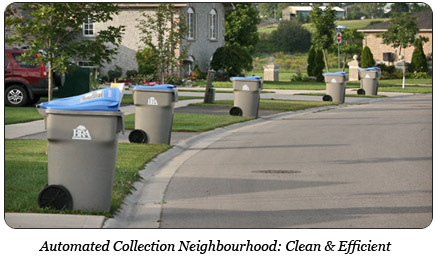 In urban areas, bins are collected on both sides of the street. No more “neighbourly” trash. 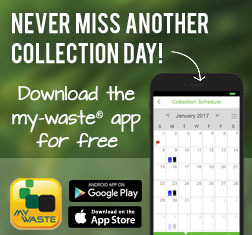 You will no longer have to purchase a blue box or a waste container if receiving co-collection automated service. The potential to reduce your cost if collection frequency is reduced because of the additional capacity of the bins. The new abundance of natural gas supply provides a reliable source of affordable, efficient energy for a wide range of industrial processes, particularly those requiring thermal heat or steam. The lower emissions of natural gas, and the ability to install combined heat and power technology provide environmental benefits. For heavy duty transport vehicles and for urban fleet vehicles, using natural gas as a fuel can provide over-life cost benefits for fleet owners, along with environmental benefits. Canadian companies are global leaders in the development and deployment of today’s natural gas vehicle technologies. North America’s natural gas resources have been increasing over the past decade, mainly due to technological advances in the recovery of natural gas from unconventional sources. Horizontal drilling and new reservoir stimulation technologies have meant that economical recovery of previously undeveloped resources has become a reality. Today, North America has a century of supply it can rely on to deliver economical, versatile, cleaner burning fuel, with advances in technology continuing to unlock new supply. Natural gas is also the cleanest burning, commercially available combustion fuel. Technologies using natural gas are highly efficient. This high-efficiency in combination with the relatively low inherent CO2 content of natural gas makes it a low greenhouse gas emission option in a wide variety of applications including space heating, industrial use, and electric power generation. As with the development, production and use of all forms of energy, natural gas has environmental impacts, but all components of its environmental footprint are carefully managed and regulated to minimize impacts on air, land and water. All parts of the exploration, recovery, processing, and transportation process are subject to strict environmental assessments and approvals. Canadian natural gas consumers can rely on the supply and delivery of affordable natural gas. Canada has a very large and geographically diverse resource base. This is continuously accessed as infrastructure expands, discoveries are made and as technologies emerge. Canada’s natural gas transportation and distribution system, a network of over 480,000 kilometres of pipelines, is designed with multiple redundancies and safety features to ensure the reliability of the system. Natural gas itself is nontoxic and will easily disperse in open spaces. In a closed space natural gas will displace breathable air, so precautions must be taken to ensure safe handling and use. For this reason, natural gas distributors add a pungent odorant to the gas to give it a distinctive smell, alerting anyone to the presence of even a small amount of natural gas. This allows emergency crews, who are available 24 hours a day, every day of the year, to immediately address any problems. If you have a lot of waste to dispose of because of a special project you are working on or you simply want to remove some bulky items from your property, you can consider getting a temporary or permanent bin from Mars Environmental. They provide containerized service with bins ranging from 2 to 40 cubic yards. 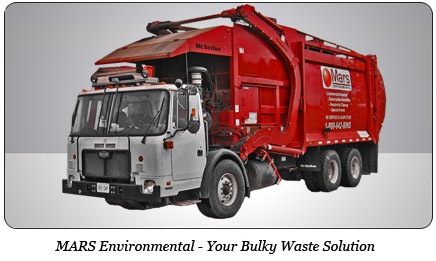 Click here to visit MARS Environmental.